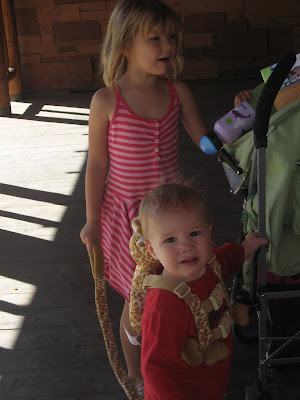 The other day I took the two little kids to the zoo. I must admit that I was feeling pretty excited. I think that this may have been the first outing that Garrett has ever gone on, in his whole one and a half years of life on Earth. I mean, really- the kid doesn't get out much. And that is a conscious decision on my part. It's not that he's not a good kid. Cause really- he is. My neighbors are always like "He is the happiest baby." "He is always smiling". And they're right. He is. And it's cause he's not in the car. Seriously. 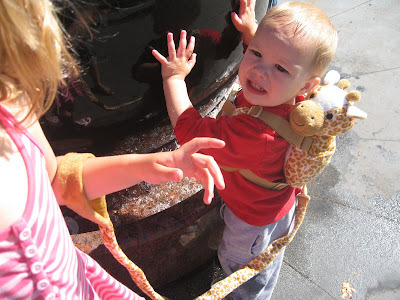 I know what makes my kids happy, and being in the car is about number 100 on the list. Sure, it's worth it if the journey is for somewhere really amazing. But over the years I have realized that lugging my kids, and schlepping all the gear that must accompany them, to some park half way across town, just to get out of the car and realize that "Crap, I forgot the juice boxes, or the wipes, or what ever thing I MUST absolutely have right at that very moment"...and then to let them play, but guess what?...they are not having any more fun on this grass at this park that is way out in the boondocks, than they would have had at the grass at our neighborhood park, or in our very own back yard. There was a time in my life...like say all of my twenties...when being able to brag was the subconcious motivating factor behind every step I made. I would go to the Boston Children's Museum, because it's so fun to be able to say, "I took my kids to the Boston Children's Museum." Or we would go out to the Cape on Saturday, because then I could say "We went to the Cape this weekend." But now, oh I am so old and wise. Can I just bask in my humble wisdom for a few moments?...yes, it's lovely. So, with all of my trips that I took when Dalton and Shelby were little, I finally had an epiphany: They could care less. Really. All the farms in Massachusetts, picking berries and apples. All the beach trips to Plum Island and Crane's Beach. All the trips in to the city to play at the Boston Public Gardens, and ride the Swan Boats, or go to the Franklin Park Zoo. All the rides on the T to eat Thai food, or Indian food, or some other fun ethnic food...not only are they not going to remember one day of it- but they could have been at home playing light sabers, and they would have been just as happy. Now, I don't regret every one of my cockamamie trips where I dragged my kids to heck and back. I enjoyed myself on some of the occasions. I got to catch up with friends, see new sights, get familiar with the city. But, when I think of all the meltdowns in the car, and the traffic jams I sat in, just to prove to myself that I was cool, and hip, and could be a Mom with kids and still see all there was to see in Boston...I wish that I could go back in time and just tell myself to chill the freak out. I mean, what's the rush? But there was one. Every day had to have some adventure or another, or I just didn't feel like we'd had a "productive day". Now adays, my definition of a productive day involves staying alive. Really. Gavin comes up from his basement office, after work. He glances at the kitchen that looks like the cabinets exploded, and the front room, where every toy in the house is covering the floor, and the bedroom, where the bed has still not been made. And you know, he is that cool, that he is happy that we have survived as well. But the good thing, is that because I am done schlepping (I am a recovered schlepper) my kids are happy. They enjoy the days. And I enjoy them. If I forget a diaper, or a juice box at our neighborhood park, I walk the block back down to my house and grab them. Ease and convenience are my new mantra. And so, it was with much consideration that I felt that we were ready for an outing to the zoo. The diaper bag was packed. Garrett had just woken up from his nap. He was happy. No one was sick. He and Shelby had just had lunch. He had on a clean diaper. Dalton was in school for two hours. Check, check, check. So we were off. 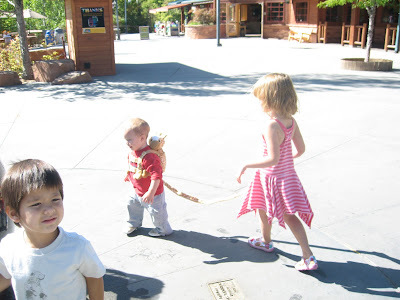 When I got to the zoo, I noticed this handy dog leash that is disguised as a kid leash. SOLD! Garrett was a bit miffed when he'd go running full speed ahead to catch the zoo train, only to be yanked back like...well, like a dog on his leash. But he quickly got the picture. Shelby, thinking that this was making up for the dog we STILL hadn't gotten her, was more than happy to have a dog for a brother. And took great joy in walking her brother. Garrett didn't take as much joy in it. 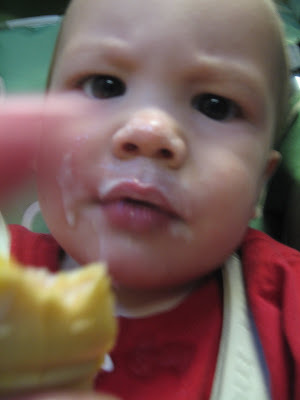 What he did LOVE were the ice cream cones that we got half way through...and the monkeys. OMG. This kid could have jumped in the monkey cage and spent the rest of his little life swinging from the fake vines with his fellow furry monkey brothers. He was leaping up and down...banging on the glass, pointing at them. Exactly what they were doing to us. And people say we're not related. 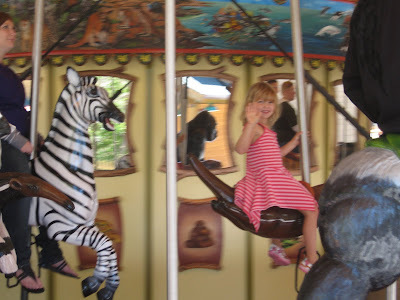 Shelby LOVED the carousel. She took turns riding just about every animal on it. The only thing that was a tiny bit better than that was the new baby elephant. Her name is Zuri, as in Cruise. It means beautiful, or lovely in an African language. She was the cutest thing I have ever seen, with her little wrinkly bum and her tiny trunk. Garrett, again, wanted nothing more than to leap in to her exhibit and eat grass with her...or eat her with a side of grass. So, the zoo was a hit. It helps that we live about a half a mile from it. And we picked a random day where there was practically no one there. Oh, except for my old friend from Boston, and her husband and kids, who I hadn't seen in five years. But of course she was there. Because that day I had not showered, and when debating whether or not to brush my hair, I declined, because "Who am I going to see at the Zoo?" Murphy's Law...gotta love it. I'm with you on this one! I HATE taking my kid places. He is so little, that he loves playing in the back yard, at the nieghbors, or at the park. He doesn't know the zoo exists, or disneyland for that matter. He is a good kid when we go out, but everything takes 5 times as long, and his patience runs out 5 times faster than normal. I'd rather go faster by myself. Plus, it helps reduce my uneeded consumer spending! leaving your kids at home, having to find a sitter, is a great diet for a budget. I love learning from your learning curve!